It might be fair to say that Daphne du Maurier wrote the book on suspense novels. 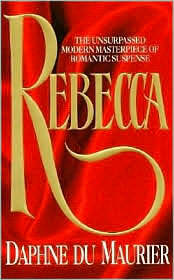 That book would be Rebecca her 1938 romantic mystery that set the bar for its many predecessors. It embodies many of the genre's tropes – twisted love affairs, a sprawling manor, breathlessly rendered settings ? and proves that in literature, as in the rest of life, the first is often the best. Rebecca begins slowly, with the unnamed narrator's launch into British high society courtesy of a marriage proposal from the aristocrat Maximilian de Winter. Gentility does not become her, and about a third of the book is simply her acclimatizing to her newfound wealth and status. Once things get percolating, though, it's evident why Rebecca was an instant literary sensation. Manderley, the enormous de Winter estate, is revealed to be a refined mortuary, where relics of the first Mrs. de Winter ? some tangible, some less so ? haunt every room. Slowly, the heroine realizes all was not as it seemed with the first Mrs. de Winter ? the Rebecca of the title – and that the questions about her strange death are not content to lie unanswered. A novel as old as Rebecca is bound to show its age. Certain aspects of this story are too dated to appreciate. The narrator's tremulous tone and the many long, drawn-out passages about the pitfalls of upper-crust etiquette, for example, bored me. But for a book written in 1938, its darker elements retain their freshness and ability to interest. I THOUGHT this sounded familiar! Have you seen Hitchcock’s “Rebecca” from 1940? I have. I saw it a long time ago, so I don’t really remember too much about it. And by the way, I love the Harlequin Romance treatment the publisher gave this cover. I want to state, for the record, that the cover of my edition was a burned-out mansion with a swooping script “R” on it. Much classier.